The Vegetarian Society was formed in September 1847, with James Simpson as its president. Just a year later the society had some 470 members nationally. This is the reverse side of a bill announcing a meeting of the society. 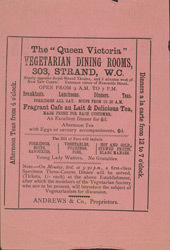 This side advertises the Queen Victoria Dining Rooms, one of the first vegetarian restaurants in London.